Top time saving tools for miniaturists and modellers aren't always powerful or expensive. Here's a list of items that can save work and frustration, and not break the bank. 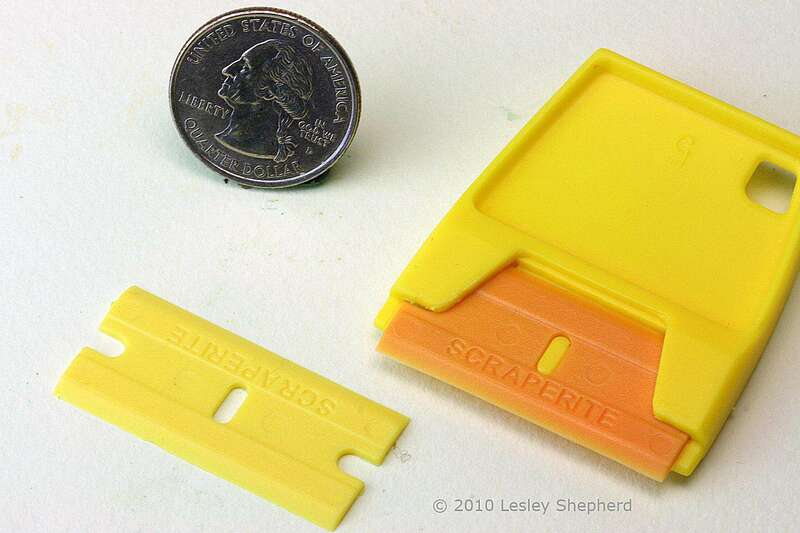 ScrapeRite plastic razor blade and blade in holder. These blades are useful for crisp creases in paper and for removing paint splatter, stickers and glue from smooth surfaces. Photo copyright 2010 Lesley Shepherd, Licensed to About.com Inc. Plastic razor blades are handy tools for scraping off paint or gummed stickers, cleaning up glue, and creasing paper. Think of them as large square fingernails or gentle putty knives. They come in a range of flexibilities, for use on different surfaces. Available from paint suppliers and hardware stores, usually in the paint or glue section. Magnetic gluing jig being used to hold parts in place on a laser cut wheel while the glue dries. Photo ©2008 Lesley Shepherd, Licensed to About.com Inc.
You can make your own magnetic jig using square sided magnets in a straight sided baking tin, or the lid of a biscuit box or cookie tin. The key is to have straight square sides and a magnetic base that will allow you to use strong magnets to apply pressure to glue joints. For very small pieces; thin laser cut furniture details, RC airplanes, model ships or other delicate parts you may still be better off with T shaped jewellery or macrame pins and a scrap piece of acoustic ceiling tile to push them into. Once again, you can do this with scraps of lumber clamped in place to a bench, or small boxes filled with pebbles if necessary. Magnetic jigs don't take up a lot of storage space save a lot of time and are easy to keep clean. Find these at model shops or online, magnets can be purchased separately if you have a suitable square edged base. Price $20 to $30 or $12 for a set of magnets. Tootbrush stand holds glue bottles ready to go. Photo ©2007 Lesley Shepherd, Licensed to About.com Inc.
Until someone comes out with a glue bottle with a flip out tip on the bottom, storing your glue upside down will save you a lot of time and frustration, especially when using thicker glues. You can make your own from scrap wood, buy one that works for most craft glue bottles, like the 'Boing' toothbrush holder, or adapt one from a small vase or a small tin like a tomato paste tin you nailed to a base. If you can't store the glue upside down, try bending a piece of metal so you can store it on it's side with a slight angle down towards the tip. Check scrapbook stores, craft stores and dollar stores for commercial versions. Cost of a 'Boing' toothbrush holder, under $5. Flexible tipped plastic glue spreader useful for applying craft and wood glues to a range of hobby materials, as well as craft wood for dolls house furniture. Photo copyright 2010 Lesley Shepherd, Licensed to About.com Inc. There are many things you can use to spread glue, but a purpose built glue spreader has advantages when applying glue to paper, wood or other bondable materials. Not only do they apply even layers of all types of glue to a range of surfaces, they can also be used to clean the glue out of corners or remove excess glue from seams before you run over the seam with a damp cloth. Most dried glues simply peel off the flexible plastic blade when dry. Find a glue spreader in the stationary section of a dollar store, the glue section of a woodworking store, or with the paper or hobby crafting tools in a craft store. A trigger bar clamp, also known as a quick clamp or quick release bar clamp is an easy to use clamp ideal for holding glued wood edges under pressure. Smaller size clamps work well for dolls house furniture and other small miniatures and models. Photo copyright 2010 Lesley Shepherd, Licensed to About.com Inc. These handy bar clamps with their pump trigger tightening action and quick release button are a wonderful time saver on anyone's workbench. They can be used one handed, and if necessary the bottom clamp can be reversed on the bar on some models to create spreaders, rather than clamps. Look for the smallest bars you can find, and watch for these to go on sale in your local hardware or building supply store. Price - from $2 - $5 each, more for specific brands depending on size.